The 100 Season 5 Interview: Bob Morley Teases Bellamy's "Gotten a Bit Soft"
Bellamy has spent the last six years dreaming of his reunion with his sister on The 100. On "Sleeping Giants," Spacekru is the closest they've been to finding a way to get back to Earth. Will Raven find a way to make it happen? And, if it does, what threats will they face? 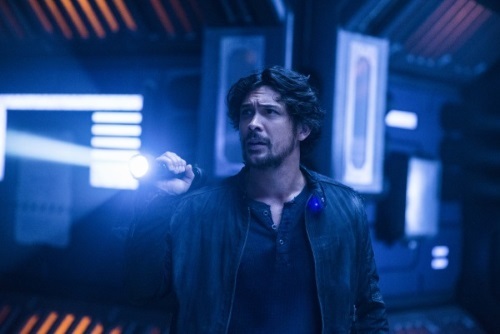 I visited The 100 set in Vancouver with a group of reporters to talk to Bob Morley about how Bellamy's changed over the time jump, his desire to get to the ground, teases about the likely reunions, and more! Check out the video interview and Q&A below! Is it good to be playing almost your own age? I don't know. I think Bellamy is definitely way more mature than me, I'm pretty immature, so... I don't know about acting my age in real life. On screen, he's much more mature than I am. Yeah. How has he changed over the time jump? That six years in space changed a lot. The group up there. We're calling them Spacekru or something like that. They are like this new family unit up there and he's had to use Clarke's advice of using his head and his heart to become more of a well-rounded leader up there. Raven is like his second-in-charge. Everyone runs things together. They always make decisions together. It's a nice community up there and it's definitely calmed him down from like fighting and killing people every other week. After the six years off, maybe he's gotten a bit soft. I'm sure he'll get back to it. What dynamic are you really excited for the fans to see that's the changed the most over the time jump? The one that I think I was really excited to get into was the Blake relationship, the siblings, to see how they've both changed. They kind of had a bit of a like a reconciliation at the end, but it was over the radios and very brief and then radio silence. That's one that's really important to Bellamy. That kind of dictates a lot of his decisions as well. Yeah, because he's pretty focused on that, that's one that I also am gravitating towards. The Spacekru and that family unit is another thing that is deeply important to Bellamy and really drives the direction he takes this season. This season, it feels like there's a couple of different shows going on, because there's so many different groups and leadership groups and who's in charge of what and where. It's interesting to see the power struggles between all the groups and actually who is really in charge. This season has been tricky for me, like with Bellamy as well, for Bellamy coming from coming from being Spacekru and knowing that he's got the backs-- [indecipherable] of those six or seven. Whereas when he gets back down to Earth that changes pretty quickly. Do you see any parallels between this season and Season 1? You know, I saw more parallels in Season 4 to 1. Yeah, like, I watched it again the other day. I think that 4 really reminded me of 1 for some reason. I'm really blanking on 4 now. All the years end up melding, I'm like, "Hang on." I got a beating in 5. In a way, returning to space there's that parallel, but the world is much more expansive now and there's much more groups. In Season 1, it was about the kids on the ground and then the Grounders. I think it's a little more complicated than Season 1. I think most of the seasons, you could draw a parallel between them all. It's strange to come back and have that six year break and then for me to try and figure out who is he after only having like six months off. Yeah, whereas, I can recall memories of one Fall quite easily and now there's like a six-year gap in the middle on the Arc. What did they do up there? You know. Trying to figure it out. Lindsay talked about that there's a difficult decision about how to get down to the ground. What are Bellamy's thoughts on them leaving the Ring? It's funny to say that he's more head and heart, but the decision to get to the ground is very much driven by his need to see what's happening to his sister. He believes that Clarke has passed away and he doesn't know any of this stuff. That's the driving force for him-- is the hope that his sister is down there. Once the Spacekru does get to the ground, what are some of the obstacles and struggles they face? There's definitely a lot of returning of Mother Nature type things-- animals, and creatures, and critters, and stuff like that. That's one of the struggles. And also, the elements, as well, and how the planet has changed because of praimfaya. It's funny in this show, you're like, we've got to get to this place and then you end up there really quickly, but then when you look at the map of where we're going, it's like really far. You're like, "How did they get there so quickly?" It's the show. We cut there. In terms of the challenges on Earth, the threat other than the elements and environments, the threat kinda is always a human threat between the groups kind of thing more than anything else. Speaking of that, when Skaikru came down, they had weapons which gave them superiority over the Grounders. These new people who are coming down will have technology as well, how does that dynamic of two groups that have that technology change that battle? It's interesting what developed throughout the bunker and the story will unfold, but Spacekru, we just have algae. That's about it. That's all we're bringing to the table here. In terms of-- maybe you're right. Maybe, there is more parallels to Season 1 and the high-tech and low-tech type of interactions like with the Grounders and Skaikru. In terms of a technology battle kind of thing, most of that thanks to Illian is all destroyed and praimfaya, obviously. That probably did most of the damage. Yeah, from my character, not so much. He's always been pretty lo-fi. Bellamy: guns and his fists. A thug. Can you tease any of the flashbacks we'll be seeing? I can't. I'm not too sure actually in terms of the flashbacks. I'm not sure how much I can say on that really. The story and the mythology of the bunker and the new people will be told hopefully. How will the relationship between Bellamy and Clarke be different once they eventually find each other? It's pretty funny. It's not funny obviously to find out she's still alive. It's obviously a huge shock for him. She's also focused on her unit, her family unit, which is Madi. And, I have my Spacekru and they really deviate in that sense. There's no longer this community of The 100 it feels like. Everyone's got their people now. There's a lot of the "my people," "your people" stuff as per usual, but in this particular season, it's very definitive as to who people are loyal to, so that dictates where their relationship is and where it goes. How much are the people who are on the ground in the conversation or thoughts of the people on the Arc? I think there's definitely a reference to how much Bellamy talks about his sister. It's obviously on his mind all the time. As you'll see, they all learn from each other from space and learn different skills through-- Each person has brought their skills and shared them with the others. I imagine there's been a lot of conversations about what's happening down on the ground, but they're really in the dark up there. I'm sure they chat about Praimfaya and all that jazz too. There's a big, smoldering planet right there in front of them. It's the elephant in the room. It occupies a lot of Bellamy's thoughts, that's for sure. What's it like to craft six years of Bellamy's life that you're never going to get to live? That's the tricky bit. Six months off and six years have passed for him. I had to think about who he was when he was on the Arc with this sister and how he was as a brother and kind of go back to that mode of who Bellamy is and tap into that vein of how he used to be. There's a lot of that. He definitely felt as a nurturing figure in terms of the Spacekru and Earth has a nasty habit of bringing out the worst in him, so yeah, it was nice to go back into this older brother, fatherly type character for a wee while until things get really bad. The 100 Season airs Tuesdays on the CW.